Article by Maria Duffy ©. One of the things we’re renowned for here in Ireland is our chattiness. Give us a pot of tea (or bottle of wine), sit us down together and we’re off. We love conversation. We love hearing stories and telling them. We love to embellish those stories until we have a tale tall enough to attract plenty of ‘oohs’ and ‘aahs’. So when I decided to write books based mostly here in Dublin, I wanted to make dialogue a big part of those stories. Every writer approaches a book in a different way. Some plot and plan meticulously, some fly by the seat of their pants and some, like me, are somewhere in between. If you asked me if I plan, I’d probably say no, but what I mean by that is I don’t write down a chapter plan or set out on paper how the book will unfold. But what I do is plan in my head. Once I have an idea about a storyline, I begin to imagine my characters – what they look like and what personalities they have. I put them in various situations and learn how they react to things. I give them fears, hopes, dreams – building and building on their characters until I know them inside out. Only then can I let them act out the story. I spend months with the story unfolding in my head before I write a single word. I see it like a movie, imagining what scenes might make me laugh or cry and trying to improve anything that doesn’t feel right. When I feel happy with everything, then I begin to write. When we speak naturally, we use a lot of ‘ems’ and pauses. I thought by inserting plenty of these into my dialogue, I’d make it more believable. But it’s definitely not the case. I know we want to make the conversations sounds real, but the fact is that too many of these pauses etc, are difficult to read and don’t add anything to the story. In some places, I had pages and pages of dialogue. This can become very draining for the reader and sometimes the characters can all blend into one. I think it’s important to have a break in the dialogue, whether it’s just for someone to put the kettle on or to see what a character is thinking. Sometimes we feel the need to identify who’s speaking by saying ‘said Mary’ or ‘chuckled John’. It’s fine to put that in here and there but we can’t underestimate the reader. If they’re following the story and if we’ve built our characters properly, they should know who’s speaking without us spelling it out for them. Listen, listen, listen! And what I mean by that is to eavesdrop, snoop and listen in on conversations. The best way to learn how to write it, is to listen to it. Take note of how people speak – how they react to each other, the tones they use and even the facial expressions they make when they’re speaking. The more you listen, the more you’ll be able to replicate conversations on paper. Make your characters individual. I find sometimes when I read a long string of dialogue, one character blends into the other and I begin to lose interest. It’s important to have characteristics to distinguish one from the other. For example, in The Letter, one of my characters is quite brash and, much to my own mother’s despair, she swears a lot. A lot of people have told me she’s their favourite character because she’s so identifiable as soon as she opens her mouth! Read it out loud! I can’t stress this enough. Scenes that seemed fine when we read them to ourselves, suddenly feel clunky and stilted when read aloud. It’s amazing how much we can learn by doing this. Much as it may seem embarrassing to do it, it’s the only way to make sure the dialogue is smooth and believable. Ellie Duggan is getting married in seven weeks. But just before she sets off for a fun-filled New York hen party weekend, she finds a letter addressed to her sister Caroline. Dated only weeks before Caroline died in a tragic accident, it contains some startling information which forces Ellie to face some truths about herself, Caroline’s death – and even her forthcoming marriage. Ellie has spent the three years since Caroline’s death running from the truth. But as the weekend in New York comes to a close, she makes a drastic decision. As Ellie finally lays old ghosts to rest, she realises that the truth can set you free. But will she be willing to take the risk? 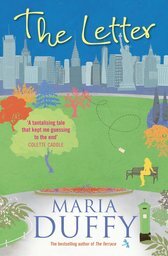 Maria Duffy spent too many years not following her dream of being a writer. After a long stint in a good pensionable job and a couple of trips around the world, she’s now settled in her beloved Dublin with her husband and four children. It was only when her youngest started school that she decided to take her scribbling more seriously and pursue a writing career. She's now the author of three published novels; Any Dream Will Do, The Terrace and The Letter. She also combines her love of writing with her Twitter addiction and writes a blog for Hello! Magazine online about celebrities on Twitter. One of Maria's favourite things to do is shoe shopping - that's when she's not eating chocolate!